Best Henry Hoover - Which Numatic Vacuum Is Top-Rated In 2019? Henry Hoover Range – Which Numatic Vacuum Cleaner Is Top-Rated In 2019? How can you not love Henry? I guarantee that if you let the kids pick a vacuum cleaner they would pick Henry and who could blame them? Henry is a real British classic and even when I was a kid I had a soft spot for Henry. I have tested many vacuum cleaners over the years. Thanks to my kids and dogs they always get put through their paces very well. I am very interested to see if Henry will still have that smile on his face once he has had a meeting with my house! The models that I am going to be looking at are some of the most popular models when it comes to the best Henry Hoover. Many people think that there is just one model of Henry Hoover, but actually, there are many. Read on to find out more. The first Henry hoover that we are checking out is the classic, Numatic Henry HVR160. This is the latest version of Henry and is more compact than his larger predecessor, the HVR200. At a little over 100 pounds, this is a great value and the Henry model that I would guess most people look at. Of course, it has that classic Henry design. I mean how can you not love this? One of the things that took me by surprise is the size. It does have compact in the name, but a large part of Henry is actually made up by his large canister that houses the dust bag. Is it weird calling a vacuum cleaner a he? You always hear about how Henry hoovers are built to last. When you take Henry out of the box you will be very impressed at how solid he feels. You can tell right away that he is very well made. The performance of the Numatic Henry Compact is far better than I thought it would be. I am not saying that I did not think it would be good, but I was not expecting Dyson or Shark like performance. Still, I was very happy with this. I started in the living room where there was a nice range of cookies, dog hair and other assorted mess to test the vacuum on and it picked it all up. The head of the vacuum is great. It has a simple to use (and really classic) button that you can flip. The idea here is that you have the brushes down when you are taking on the hardwood floor. I have a hardwood floor hallway and was very impressed with how this handled it. For carpet, you want the brushes up, but I found that for really awkward messes like the aforementioned cookies, the brushes can actually work pretty well on carpet as well. One of the things people love about Henry is the long hose. It is kind of like you are vacuuming up stuff with his nose, which I know is a little weird, but it is something that people seem to really like. The Numatic Henry Hoover also comes with a very long power cable with the idea being that you can do a whole room or maybe even more without having to change power sockets. Henry also comes with a bunch of tools to make your life much easier. The upholstery brush is pretty awesome and I used it to vacuum the sofas. These things get filthy thanks to the kids, dogs and myself when I am binge watching stuff on Netflix. This tool also worked great on the curtains and beds. The crevice tool is fantastic. Henry already has a long hose and you can put the crevice tool on so that you can get under the sofas, tables and even get right up into the corners of the room. You will be amazed at what you can use this crevice tool for. It also comes with a soft dusting brush which you can use for areas that are a little more delicate. Read More: Dyson or Henry, which is better? Now, this Henry does require that you use bags to collect what you are vacuuming up. However, the kind of bags used are very large capacity and they have a smart filtration system in them so that they keep all of the nasty stuff you vacuum up inside. Once the bag is full it is as easy as opening the top up, removing the bag, throwing it in the bin and putting a new one in. They have made it as easy as possible. While you may not like the idea of using a bagged vacuum cleaner in this age, I can tell you that these bags hold way more waste than bagless vacuums. I really like the Henry Hoover HVR160. It is a solid vacuum cleaner that can handle a lot of waste, it is very easy to use and it cleans up very, very well. You get all of this for close to 100 pounds so I feel that it is a great purchase if you are looking for something affordable. Hetty Hoover is Henry’s little sister, and she is just as popular as her iconic brother. The Hetty HET160 is the replacement for the bigger Hetty HET200, which is no longer manufactured. While she may be smaller than her predecessor, Hetty still has a 6-litre bag capacity, which is up to 5 times more than most bagless vacuums. She is easier to handle because of the smaller size and takes up much less room when it comes to storing her. Like Henry, Hetty has a sealed system so that no dust escapes back into the room, which is great if you are an allergy sufferer. The bags are easy to empty, and again no dust escapes during the emptying process, unlike most bagless vacuums. So, the important question that everyone always asks – “what is the difference between Henry and Hetty?” The answer is the colour. Hetty has all of the same features and powerful suction as Henry, the only difference is she comes in a lovely pink colour. If you are thinking about buying a Henry hoover but would like him to be a bit more feminine, then Hetty is the vacuum for you. Before I was sent this army of Henry vacuum cleaners, I did my own little bit of research in regards to what is the best Henry Hoover and this Henry Cordless vacuum cleaner came up time and time again. At a little over 200 pounds, this Henry model is quite a bit more expensive than its little brother. However, this Henry is a very clever mix of the things that made the original Henry so popular and also modern cordless technology so you really are getting the best of both worlds here. Once I had released Henry from his cardboard prison, I was once again reminded how they build these things to last. Even this more recent model has the same sturdy and solid kind of feel to it. Honestly, Henry hoovers are some of the most well made and tank like vacuum cleaners I have had the pleasure to test over the years. I need a vacuum that can handle carpets, hardwood floor and the mess that kids and pets can leave all over them. Henry Cordless was more than up to the task. The living room is always the first room that I test. I ran Henry over the floor and I was very happy with the level of cleaning it has. Like the other model, the head of the vacuum has that button you can press so that you can have the brush down or up. The idea is that the brush is for hardwood floors and it does help. But I found that it worked well on carpet too. The accessory kit that comes with this model of Henry is the same as the other one. But one thing I forgot to mention before was all these accessories clip to Henry and they are very easy to clip on and off. I love the upholstery tool and found that it actually cleaned my sofas better than some other more expensive brand of vacuum cleaners. Curtains, the beds and anything you can think of can be cleaned with this tool. The crevice tool is great as it lets you get into those nooks and crannies that the regular head cannot. Last, but not least is a more delicate brush that you can use to get the dust of things like ornaments and the TV unit which was what I actually used it for and it worked like a charm. This particular Henry is cordless and he comes with two batteries. These give you 30 minutes of run time in the lo mode and 20 minutes of run time in the hi mode. That is right, you have two modes. I found that having it on hi mode the whole time is best. They give you two batteries and they are very easy to swap in and out so you have more than enough time to use the vacuum on hi mode the whole time. The amount of waste that the Henry Cordless can handle is crazy. Right on the box, it says that it can handle as much as 10 times the amount of mess that other brands can! They like you to use these very good Hepa Flo bags which keep all of the mess trapped inside and once they are full, which takes ages by the way as when I was testing this out for a little while I never had to change the bag once. Once full, you take it out and just dump it in the bin. You never have to worry about touching the mess or it coming up in your face when you remove the bag. I know that the price tag of the Henry Cordless is a little higher than its counterpart. However, the fact that it is cordless does give you a lot more freedom and getting two batteries in the box is great as it gives you double the cleaning time. Harry Hoover is one of the most popular members of the Henry family, and that’s down to the fact that he is specifically made for homes with pets. While Henry and Hetty are good all-rounders, they don’t match Harry when it comes to dealing with pet hair and odours. Harry has most of the same features of Henry, with the added bonus of extras that are specifically made to make your life easier if you have pets. He has the same great suction as Henry and also has the cord rewind feature which is important for most people. 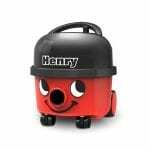 He is bigger than the Henry and Hetty 160 models and comes with a 9 Litre dust capacity. This makes Harry one of the largest cylinder vacuums on the market and the bags really don’t need to be changed that often, saving you time and money. One of the features that sets Harry apart from his siblings is the HairoBrush. This is a turbo head that excels at picking up pet hair from deep in the carpet fibres. It also works well on hard floors such as laminate and tile. 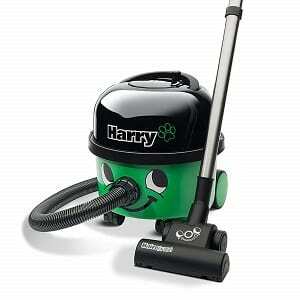 If you don’t have a lot of carpets then Harry can be used with one of the standard cleaning heads. Another reason pet owners love Harry is that he comes with a charcoal filter as standard. Charcoal absorbs pet odours and stops the smell from coming back into your room. The charcoal filter also stops any odours from sitting in the bag, causing a smell every time you use the vacuum. Harry is definitely the best option if you live in a home with pets. The combination of standard Henry features and extra tools to combat pet hair and odours creates a very happy household. The last one we are looking at in the Henry range is the Numatic Charles Wet and Dry. So as you can see we are now dealing with Charles who I am assuming is Henry’s brother. Charles is a little bit bigger than Henry in the height department. He still has that solid and well-made feel the two Henry models do though. As this is both a wet and dry vac you may think the price tag is high, but it is actually under £150 which is very reasonable. The Numatic Charles Wet and Dry vacuum cleaner has a lot of power behind it as they have used a bit of a stronger motor in here. I, of course, started with the basics which are the living room and the hallway. It worked like a charm on the carpet and managed to get all of my daughter’s morning Frosties up off the carpet with ease. As it is part of the Henry family, the head of the vacuum has that button you can flip so you can go from brush down to brush up. As I have said before the idea here is that one is for hardwood and the other carpet, but I find them both useful. It, of course, comes with a whole bunch of tools for you to use. These include the same crevice tool and gentle brush tool that the other Henry models come with. However as this is both a dry and wet vac it also comes with extra hoses, a larger vacuum head and a special hose that is there for those wet messes. In all, you are getting all you possibly need to not just clean up the general mess, but things like the washing machine spilling, the sink overflowing and other spills that could turn into stains without Charles there to help you out. I actually used the wet vac mode to clean out the back of the car and I was impressed with how easy it was. The Numatic Charles Wet and Dry vacuum cleaner also has a nice long power cord so that you can get all over the house. What I liked about this was that I really wanted to test it out on the garage floor and I did this without plugging it into the power socket we have in the garage and I was able to go straight from the hallway to the garage which was great. Once you are done the power cable rolls all the way back in and of course there is also space on Charles to keep those tools nice and safe. The idea is that Charles takes up as little space as possible and is as convenient to use as can be. A nice and large canister is used and like the other Henry models, this one uses disposable bags, although there is the option to buy a reusable cloth bag if you do not mind having to clean it out. The filtration system is great in general, but the way it seals all the dust in the bag means that it never gets spat out which is great if you have dust allergies like me. You open up Henry, pull out the full bag and then put in a new one. It is super simple and it can hold a whole lot of mess before you even have to worry about changing the bag. Of course, when it comes to using it in wet mode, you just fill it up and then pour it all out when it is getting full. I have to be honest and say that a wet vac is not something I would get a ton of use out of, but as this is only slightly more expensive than the standard Henry, the Numatic Charles Wet and Dry vacuum is great value for money. It has a whole bunch of tools that you can use, is easy to use and will give you many years of use. The George GVE370 is part of the wet and dry range of vacuums by Numatic. It is more expensive than Charles, but it has more features and it truly is an all-in-one cleaning machine. For a start, it has a massive 15 Litre dry capacity, which is reduced to (still huge) 9 litres when using it as a wet vacuum. The George excels at picking up dry and wet messes, and it is easy to switch between the two functions. While George is good at picking up dry dirt and debris, where he really shines is his wet capabilities. He can be used for cleaning up spills, drying floors after cleaning, washing and drying upholstery, and he can even unblock drains. 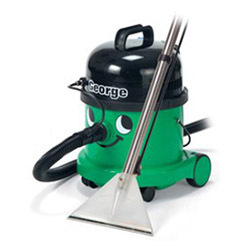 George has a power rating over 1000W, making him more powerful than most Numatic vacuums. This is due to the highly efficient Twin-Flo bypass vacuum motor and Powerflo pump system, giving George great power to clean up even the toughest spills. George also comes with a wide range of accessories, including a floor scrubber and extraction tools. If you want an all-in-one cleaner that won’t let you down, this is the member of the Henry family for you. So we have looked at the most popular models in the Henry range, but now we are looking at some of the reasons as to why these are so popular. 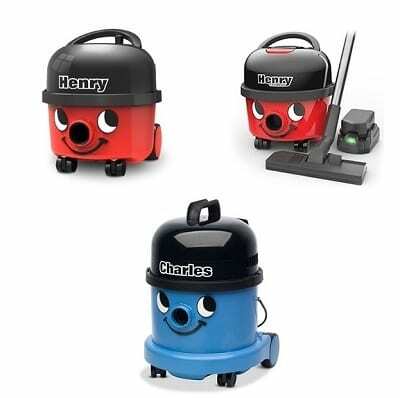 While Henry will always have that cheeky smile as will the rest of the Henry clan, the technology that powers these vacuums is always changing with the times. So while it is easy to think that just because it looks the same as it did a decade ago, the fact is they have upgraded pretty much every aspect of the vacuum to make it as powerful and good at its job as possible. Henry, Charles, Hetty and the rest of the gang are far more high tech than their cute appearance suggests. Currently, the Henry vacuum cleaners are powered by an impressive Twin Flo two-stage, 1200 w professional motor. While many vacuum cleaners are moving away from having bags, Henry vacuum cleaners prefer the classic bagged method. They make this as easy to do as possible and thanks to how large the Henry canisters are the bags that they can use can hold a lot of mess. Also due to the way these bags are made, all the mess stays right inside. One of the things that put some folks of getting a bagged vacuum cleaner is the thought of having to buy bags. Bags are nowhere near as expensive as you would think. I will give you an example right now. On a well-known online site that sells pretty much everything, you can purchase a pack of 20 Hepa Flo Henry bags for well under 20 pounds! These are the official Henry bags so you can get cheaper non-branded ones, but these ones are designed with keeping all the dust inside the bag. With how much mess these bags hold, 20 bags will last you a very, very long time. Henry vacuum cleaners have been impressing people since the early ’80s and chances are that one your grandma used when you were a kid still works to this day. I do not know the technology or the process for the way that these motors and insides are made. But I do know that one of the things that they really pride themselves on is making vacuum cleaners that give the user many, many years of use. While today we have only looked at two Henry’s and one Charles, there is also a Hetty that does what Henry does, but is a girl. James, who is yellow and a little more compact and super quiet and energy efficient. George is a bit of a show-off. 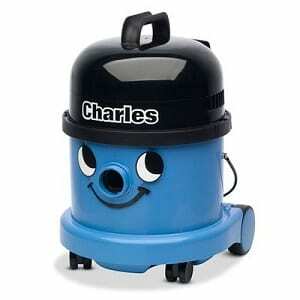 Like Charles, he is a wet and dry vac, but he can be used for pretty much any surface you have. Many businesses that need a more robust vacuum will go for a George. So while Henry is the star, it is worth looking at the full Henry Hoover line-up as each vacuum has its own thing that makes it special. Henry is light so he can be dragged effetely all over the house. He comes with all the accessories you will ever need (so do the rest of his family) and they have that super long power cord that lets you vacuum all over a floor of your house without having to change power sockets every two minutes. They have cleverly designed their vacuum cleaners so that they make cleaning less of a hassle. Henry Will Make The Kids Want To Vacuum! The vacuum that I have been using in my home is a well-known brand and if I asked my eldest to vacuum I would be looked at in horror and disgust and most likely asked for at least five pounds! However, Henry looks so cool and cute that kids love him! This is just what you need to inspire the kids to take on vacuuming as one of their jobs around the house. I know this for a fact because my kids were actually arguing at one point over who got to use Charles to clean the back room! All of the models we looked at were great and I am honestly having a really hard time picking one between them. I really liked the way the Henry Cordless came with two long-lasting batteries. So you get all the goodness of Henry, but with no power cable dragging behind you. I think that makes it an even better vacuum if I am honest. 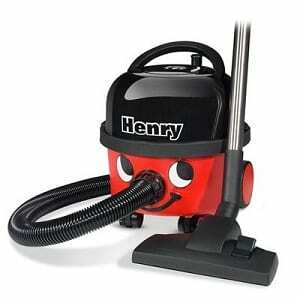 However, it is considerably more expensive than the Henry HVR160 which does come with a very long power cable. At a little over 100 pounds, I honestly think it is an absolute steal. As for Charles, I never thought that I would need a wet vac, but I did find it pretty handy and considering it is only a little more expensive than the compact Henry, you may be interested in having a wet vac on hand. I really do not think you can go wrong with any of these, but if I had to pick a winner I think I would actually go for the classic Henry Hoover as it is so affordable and it does a great job.